Up to 80cm tall, usually a lot shorter. 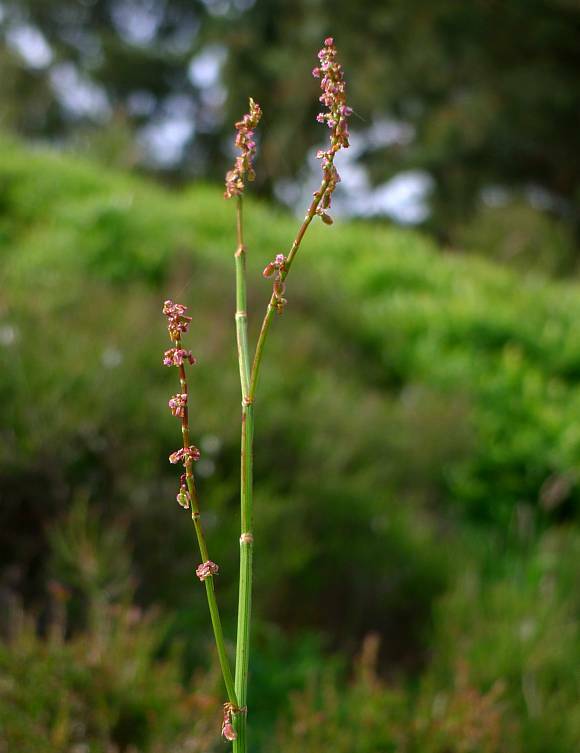 Spikes of flowers, sometimes visibly tiered, on ends of several flowering stalks branched off the main stem. Stem round and ribbed. Flowers at first greenish. 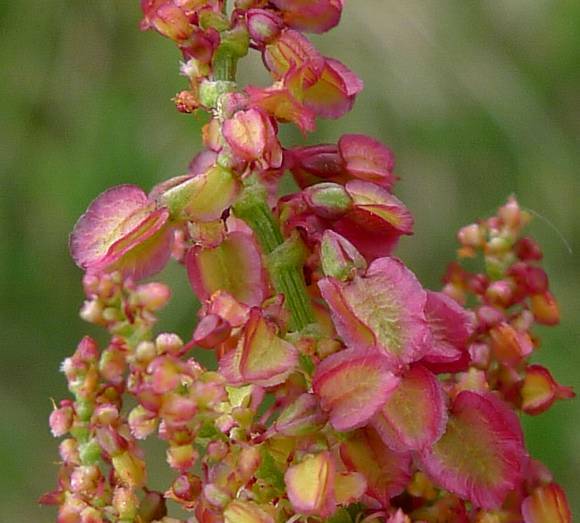 Common Sorrel is dioecious, meaning that male and female flowers are on separate plants. 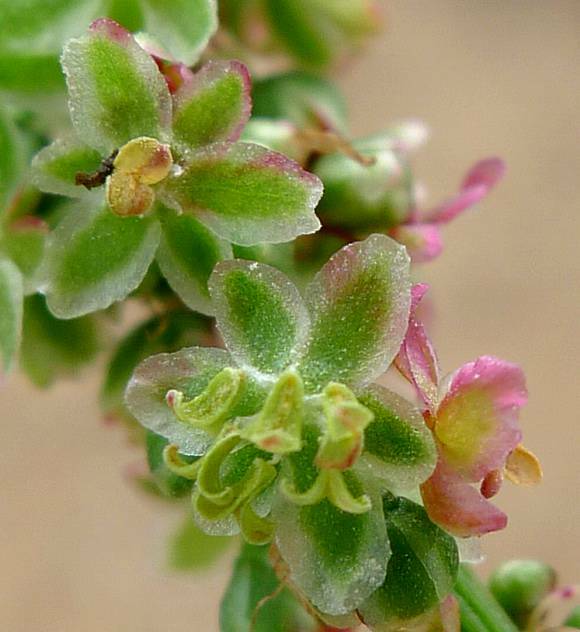 Male flowers with three oval white-rimmed light-green petals with three smaller white-rimmed light-green spals behind (centre). Un-opened flower bud extreme left of dead-centre. 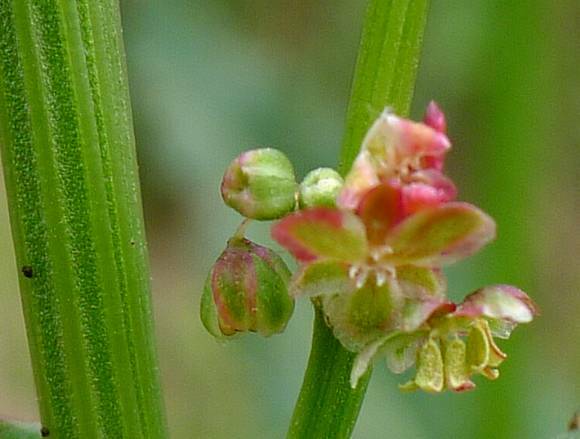 Male flowers bear six pollen-bearing stamens (the lime-green bifurcated flat 'springs' bottom middle). The upper flower has lost all six stamens, the lower still has some. Flowers hang in pairs on long fine filaments (right and top). 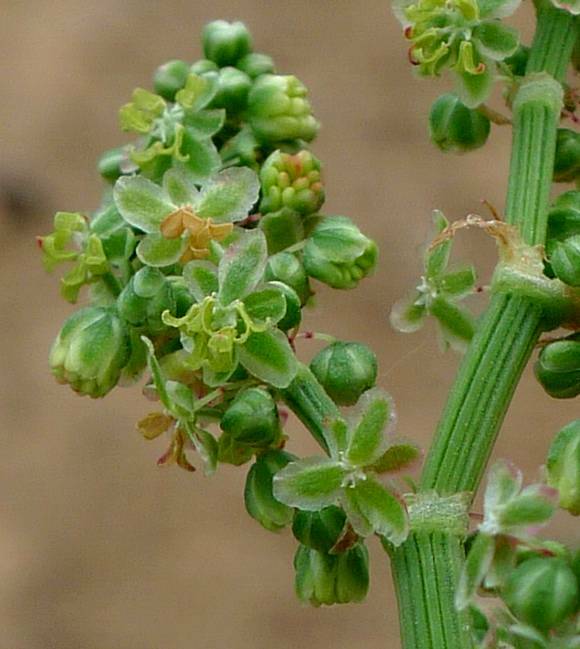 Female plant is the same apart from the flowers. 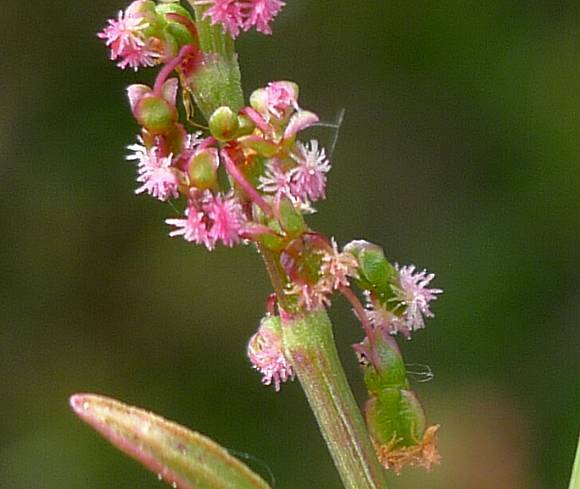 Female flowers are surrounded by a tiny stubble of white to pink to red 'hairs'. 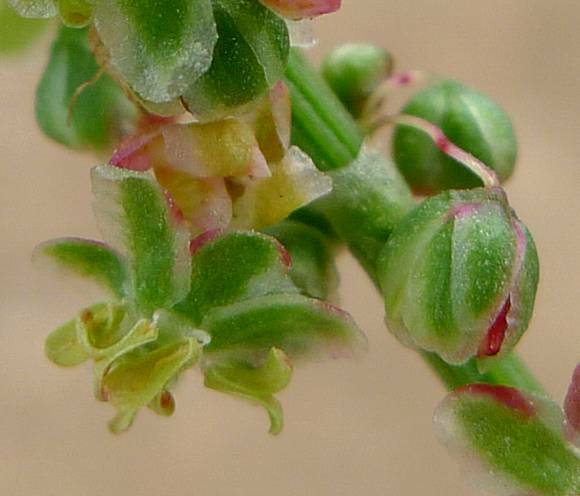 Female flowers have three styles (not visible in photo). 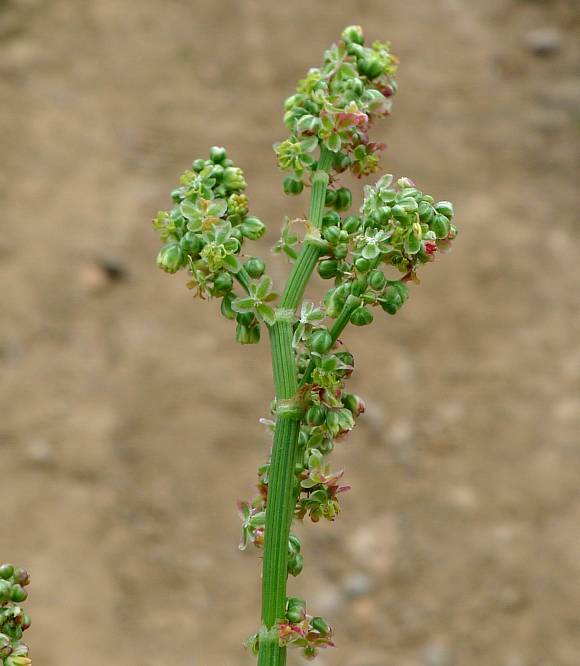 Female plant. Flowers mostly turned to red fruits. Fruits have four wings and just one small wart. Stemless leaves clasp the stem with auricles pointing backwards. Auricles on stem leaves almost encircle the stem and point towards each other. Easily mistaken for : many other Docks at a casual glance, but this is the only one with auricles nearly encircling the stem. 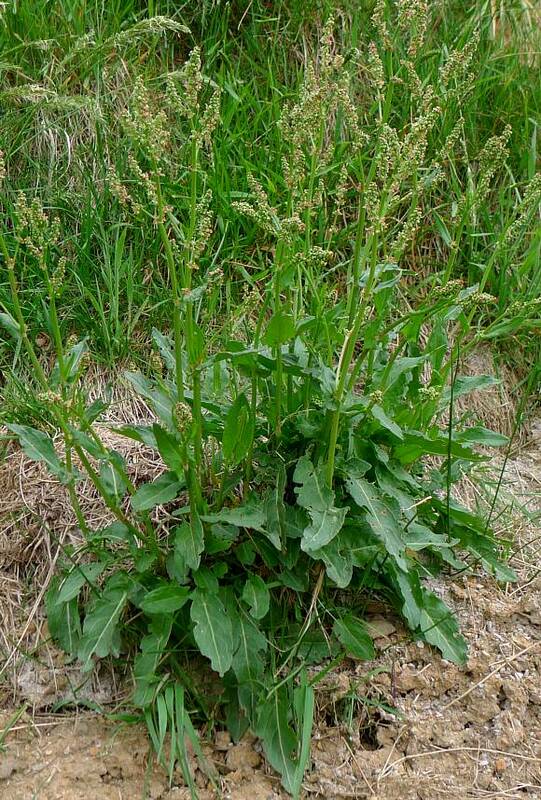 Some similarities to : Sheep's Sorrel but that has leaves on thin stalks rather than attached directly to the stem and with a stem-encircling auricle. 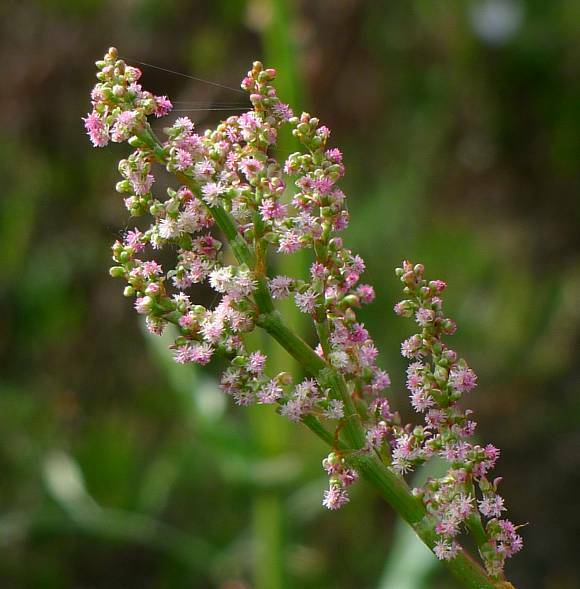 Distinguishing Features : Only two Rumex species of Dock are dioecious, having male and female flowers on separate plants, being Common Sorrel and Sheep's Sorrel. 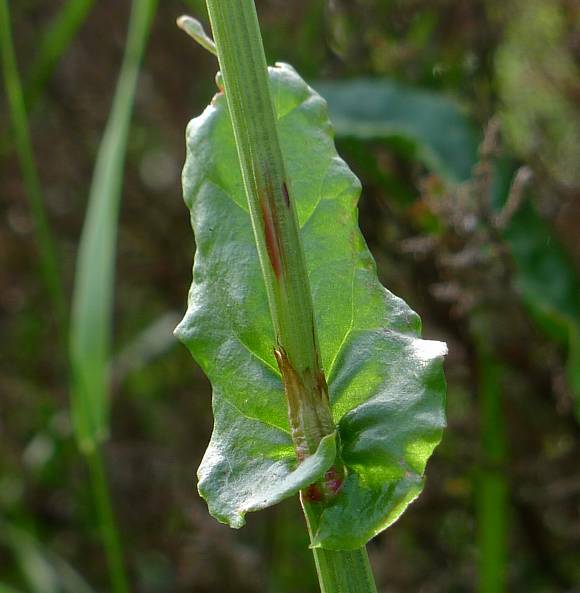 Only one Rumex species has leaves without stems, Common Sorrel. 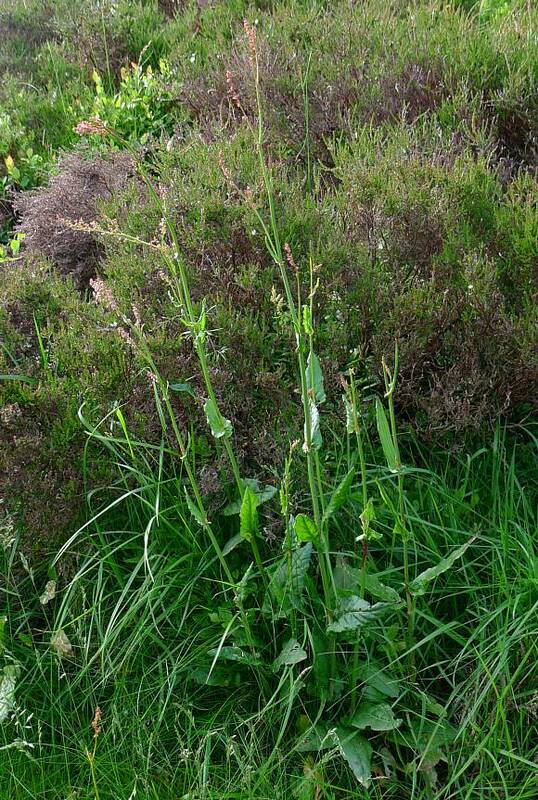 (Sheep's Sorrel has leaves on long thin stems). No relation to : Wood-Sorrel (Oxalis acetosella), Pink-Sorrel (Oxalis articulata), Pale Pink-Sorrel (Oxalis latifolia), Spreading Yellow-Sorrel (Oxalis corniculata), Least Yellow-Sorrel (Oxalis exilis), Upright Yellow-Sorrel (Oxalis stricta), Pale Pink-Sorrel (Oxalis latifolia), Purple Pink-Sorrel (Oxalis debilis) nor to Lilac Sorrel (Oxalis incarnata), [plants with similar names belonging to a differing Genus, Oxalis, which belongs to a differing family, Oxalidaceae, although both genera possess salts of Oxalic Acid such as Calcium Oxalate]. 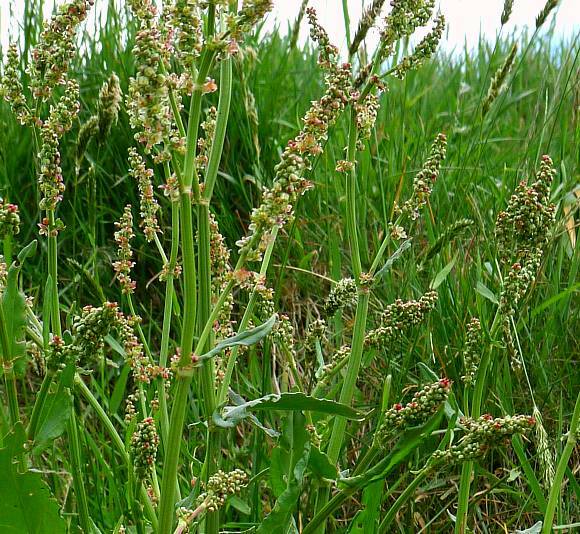 Although many docks hybridize with each other, Common Sorrel is not one of them. 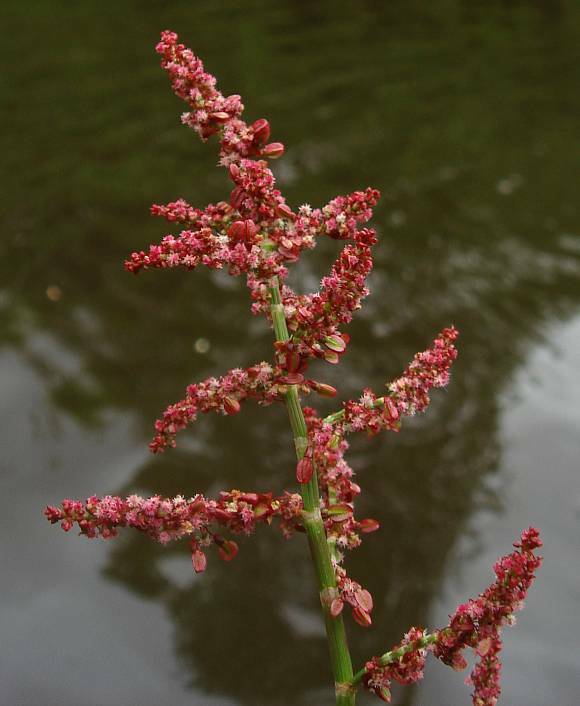 Common Sorrel (Rumex acetosa subsp. biformis) found only near the coast in few locations south of Aberystwyth. 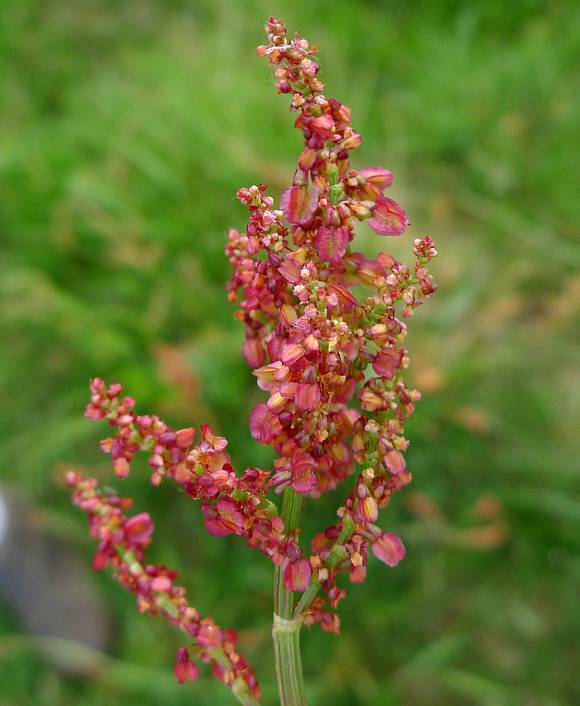 Common Sorrel (Rumex acetosa subsp. hibernicus) was found in very few locations on the west coast of Eire but now only near Waterford. None of the photos above show any of these rare sub-species. Both red and yellow dyes can be extracted from the plant. Like other Docks and Sorrels Common Sorrel has an acid taste due to the presence of poisonous Oxalic Acid, specifically the calcium salt, Calcium Oxalate, which forms extremely tiny needle-shaped and extremely sharp crystals called raphides , which, when consumed, cause mechanical damage to cells puncturing the membranes and allowing things out and foreign substances in. 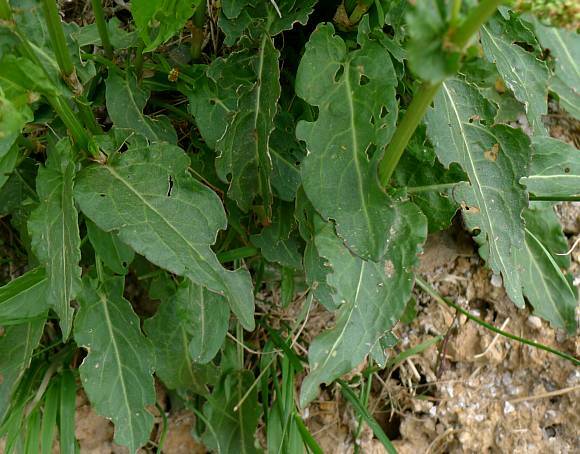 That said, like other Sorrels, the leaves are still used in salads (not many leaves are used in salads). It is only fatal when great quantities are consumed as would happen if it were eaten as a vegetable instead.